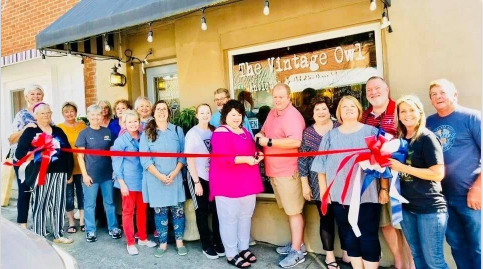 The Smithville-DeKalb County Chamber of Commerce had a Ribbon Cutting for new Chamber member, The Vintage Owl located at 109 West Walnut Street in downtown Smithville. Owners are Chase Collins and Michelle King. Operating hours are Thursday to Saturday from 10 AM to 5 PM and Sundays from 12 to 5 PM. Fresh cookies, coffee, and water are there for their customers to enjoy while browsing their store. Check out The Vintage Owl on their FaceBook page. For more information, call Chase at 615-489-3998 or Michelle at 615-390-5698.